This means, that a family of four at the beach, lake or pool, for a full day - say 8 hours - should use about 16 ounces of sunscreen: applying 1 ounce per person, re-applying at least every 2 hours (so at least 4 x in 8 hours, that is 4 ounces per adult) times a family of four, that’s 16 ounces. Now you see why we sell 16 oz. bottles of sunscreen lotions - because it makes sense. This is why NO-AD® has been called the Common Sense Sun Care for decades. Plus, our 16 oz. lotion bottles offer twice the quantity as 8 oz. national brands for less cost per ounce. Do you burn often? If so, you need a product that offers strong protection from the sun, even when you're not bathing in it. Use at least an SPF 30 broad spectrum sun protection product. Do you burn moderately and tan gradually? Just because you eventually tan, it doesn't mean you don't need protection. Try using NO-AD SPF 15 or SPF 30 Lotions. Do you rarely or just slightly burn? If so, try using NO-AD SPF 15 Lotion for extended time in the sun. Do I Need To Take Extra Precautions for my family if they are taking medications and in the Sun? Photosensitization, an increased sensitivity to sun exposure, is a possible side effect of certain medications. This includes certain kinds of antibiotics, heart and blood pressure medicines, antihistamines and antidepressants. Consult your physician or pharmacist regarding photosensitization related to any prescription medicines. At What Age Should My Baby Begin Wearing An SPF Product? Babies under 6 months should be kept out of direct sunlight. Their skin is thinner and incapable of producing enough melanin to adequately protect itself. According to the American Academy of Pediatrics, for babies older than 6 months and continuing throughout adolescence, the chances of sun damage or developing skin cancer are greatly reduced when using a proper level of broad spectrum UV protection. Moms: do you know what SPF the family needs? How long will the family be out in the sun? What is the UV index for the day? What time of the day will the family be out in the sun and what activity will they be doing? What is my family’s skin type? 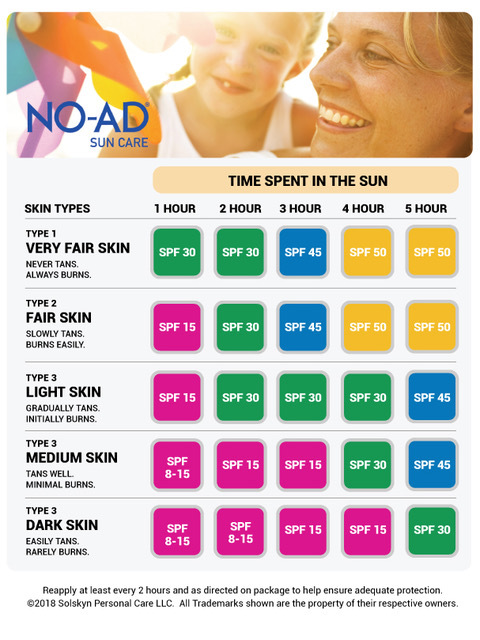 Our easy to read SPF chart helps you determine which NO-AD Sun Care product is right for you and everyone in your family.